Some do not match (3DO) and others are "strange" (PS1 and Saturn). 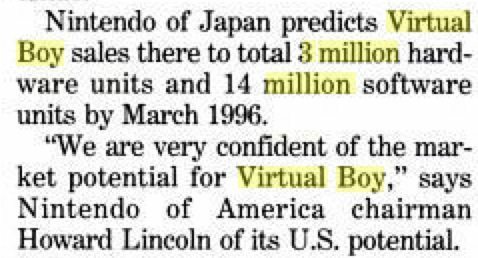 PS1 is through May 4th 1995, I guess Sega made a similar 1m announcement around the same time. 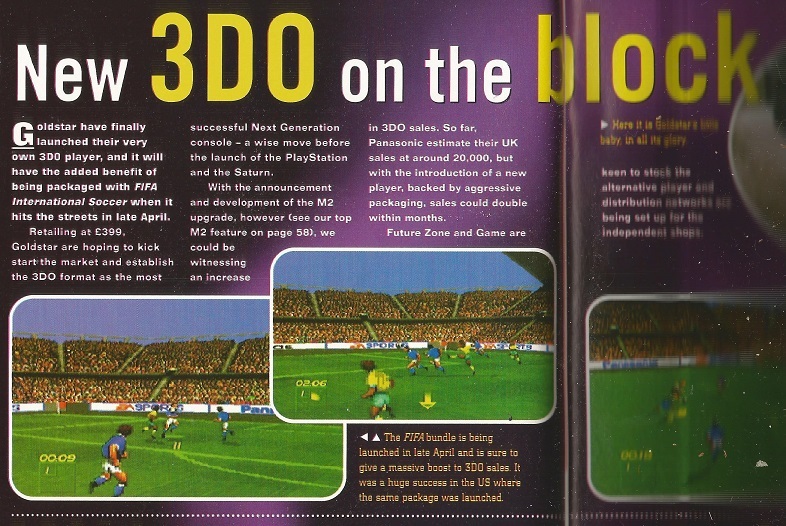 Maybe 3DO is worldwide including GoldStar, that's the only way it could match the known numbers. Some forecast for '95 but by who? 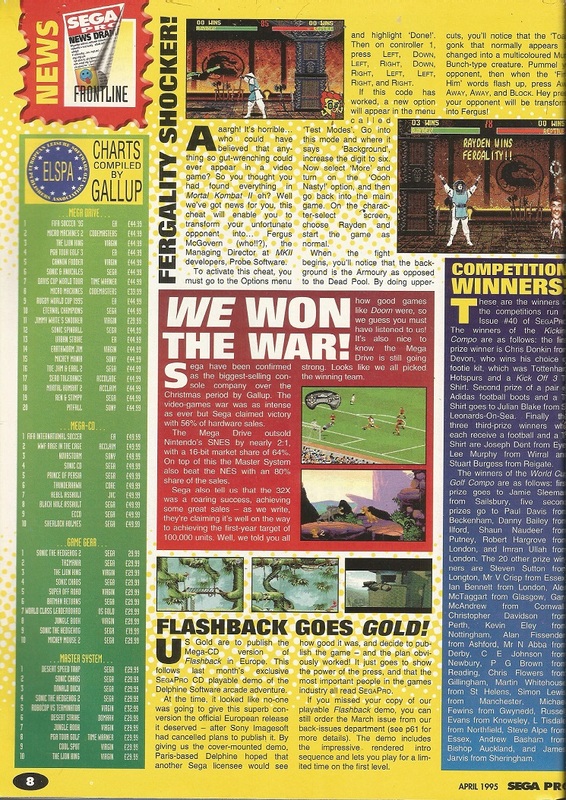 (Famitsu 321). Yeah, it's the only way. So, I investigated the PS2 shipment numbers a bit, because Sony posted a million different numbers in several reports and half of the numbers are "production shipments", the other half is "unit sales". Any idea how much the "production shipment" numbers affect the LTD sales? 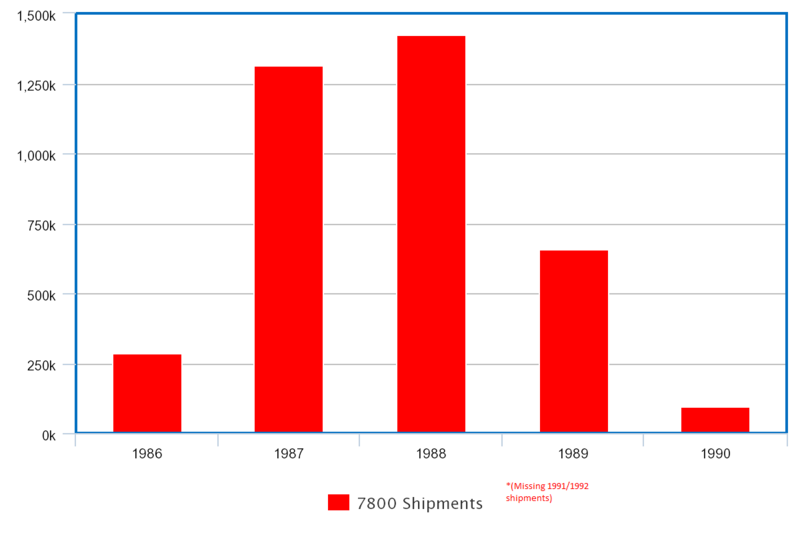 FY3 2007 is the only year with overlapping "unit sales" and "production shipment" numbers and they are fairly different. Edit: Ok, the quarters are fairly different because they have to produce more units in Q3 for the holidays, the numbers for the whole year are quite similar. Sony stopped to include the PS2 in their reports after April 2013 (or First Quarter of FY3 2014). But they combined the PS2 with the PS3 in it's last recorded year, so we don't know the definitive sales. Up to March 2012, the PS2 had LTD sales of 157.860.000 units. The maximum with the last year is 174.360.000 units. We can only guess the FY3 2013 numbers, but everything up to 4.000.000 units (probably half of that) should be a good guess, therefore the final LTD of the PS2 should be around ~160.000.000 units. Unfortunately no source is given. Wonder where they got their number. Saturn software LTD was 80 million as March '98 while Dreamcast software LTD was 58.21 million as March 2002. If it's on page 159 it's under the point "Accumulated number of hardware shipments". Seems like they cost 7.000 Yen + tax* or less, which is 57,66 $ + tax (+ shipping probably), you can buy all reports back to 1998 (but some are out of stock probably). CESA White Paper report 2014 was the source for MD hardware LTD (30,75M) but doesn't seem to be the source for software LTD and I doubt CESA would go through the trouble to add old shipment information to latter reports (compared to *that* one we know). You're right and the category only mentions "Accumulated number of hardware shipments". And the Pikachu themed N64 console sold... 50,398. They're company forecasts. SNK don't want to play though, neither revealing shipments or forecasts. This preview of CESA White Paper 2009 has software shipment numbers (but only the last rankings from #370 - #279), look at the last pages. 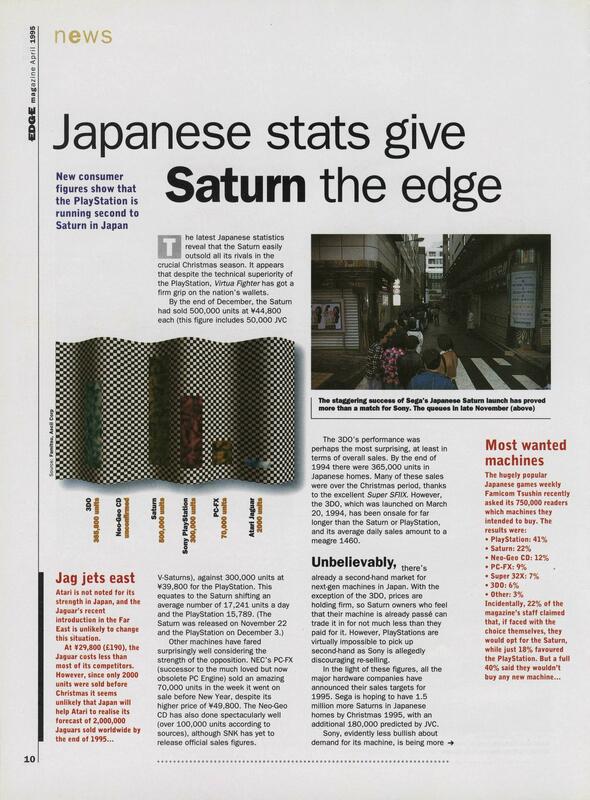 But it has some more recent software data (up to December 2008), useful for some GCN games for example. Will look into it later and maybe update the Nintendo million seller thread. 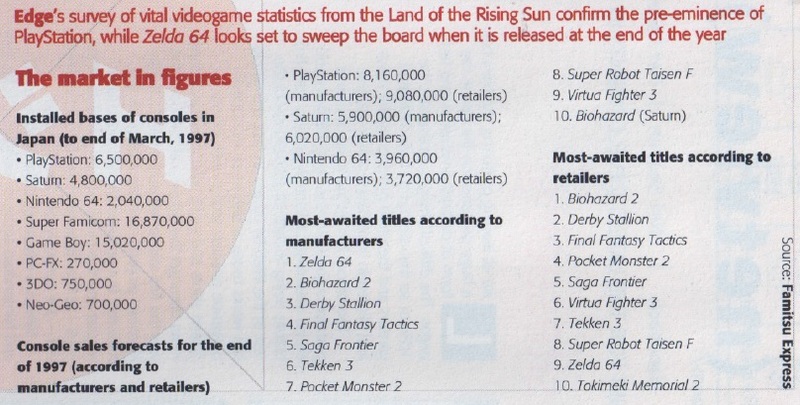 But seems like the GCN version of Twilight Princess isn't included in the list (it's up to Super Metroid which is 1.420.000 units), the last update on TP was 1.320.000 units, so it sold at least 100.000 units between March 2007 and December 2008. And the total for Twilight Princess [GCN+Wii] is at least 8.680.000 units then. If anyone is interested, there are three copies of CESA White Paper 2009 in the amazon.com marketplace: http://www.amazon.com/gp/offer-listing/4902346192/ref=tmm_other_meta_binding_used_olp_sr?ie=UTF8&condition=used&sr=8-3&qid=1426611756 (it's only around 35$). Maybe I'll get the 2014 report on amazon.jp as soon as I figure out how to buy from there lol. I believe if you buy from the marketplace then you need a proxy however if you buy directly from Amazon they ship the item to where you live. Nice find. Too bad is not the full ranking, would be very nice to have it. ps: Namco shipped 1m copies of Soul Calibur II on Cube alone, didn't knew about that. This Wikipedia page List of Game & Watch games also lists approximate unit sales for every entry, but no source is listed. 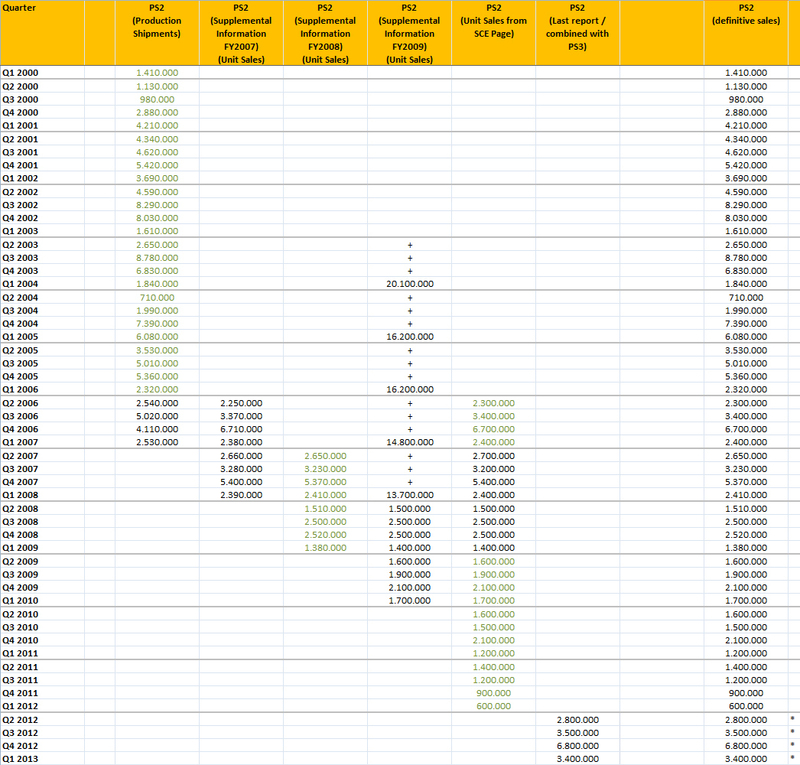 If you combine all sales you get a minimum of 21.510.000 units and a maximum of 32.760.000 units. The last one is closer to the shipped number of 43.400.000 units, but still 10.000.000 units away. Yu-Gi-Oh! bigger than MGS, take that Kojima. This is for PS2, Xbox and PC? Can anyone help fill in the gaps below? 32X - about 6,000 cartridge games sold (NOT including the two CD32X games above) - this includes all sales for the 12 32X carts released in Brazil: Star Trek, Virtua Racing, Star Wars, Virtua Fighter, Doom, Blackthorne, Mortal Kombat II, Kolibri, Super Motocross, Cosmic Carnage, Metal Head, Golf Magazine, Knuckles Chaotix and Tempo. Introducing the Sega CD and the 32X werent the only measures in that regard. TecToy also offered the Sega Club, a sales channel aimed directly towards the end customer avoiding retail, in which TecToy offered a CDX bundled with Night Trap and two other games as special sales deal, among other things. 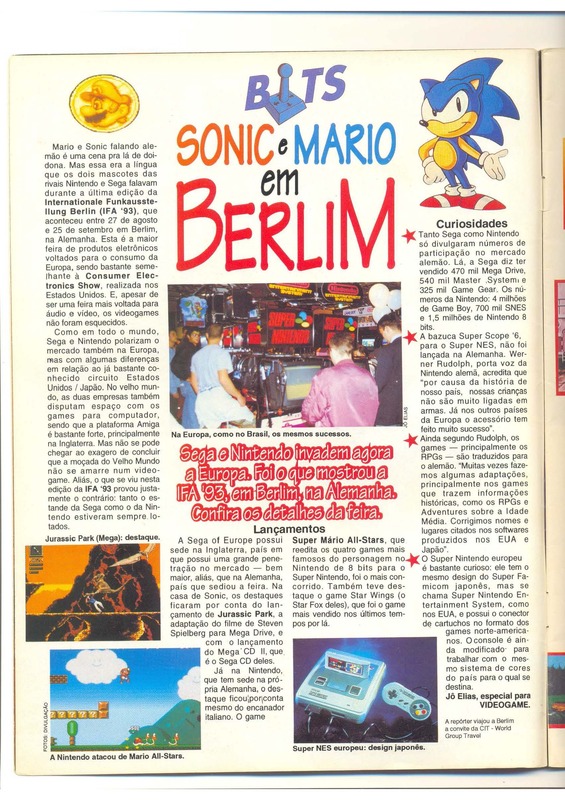 According to Arnhold, something between 10 and 20 thousand units were being sold in Brazil this way. Excellent article, I'd love to have access to TecToy's archive. Has 32X Surgical Strike never been dumped? Why were software shipments in Europe so much lower than NA when the hardware difference isn't that big? Does Europe just buy less software overall? Same happened with the PS2 so your theory sounds correct. As of end of 2006 the PS2 had sold 46.53 million units in the USA with software sales exceeding 552 million, in Europe the PS2 had sold 44.07 million units with software sales exceeding 431 million units. High levels of piracy. It's not just Europe either, but "PAL Territories" which includes a lot of developing nations. I have 0.3m for Q3 94/95 and assume that Q4 would then be 0.55m but can't back that up. Also FY95/96 I've got nothing except Q4. 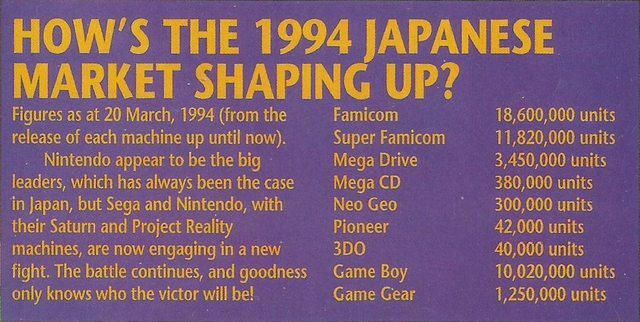 They never announced 1995 Q1-3 shipments. 0.85m was just Famitsu's estimate based off of number of days it took to reach 1m. Thanks for confirming. Appreciate it. An important correction to the Sega-16 Surgical Strike 32X article -- after I and a few others were asking some questions on the forum, the author went back to ask his TecToy contact about the sales, and the numbers from my last post were wrong. "each has sold around 500 units. The first were just preliminary information, out of production files, not sales files"
('Each' refers to Surgical Strike and Fahrenheit.) That makes a lot more sense. No. The one or two people who own known copies aren't sharing. Note that as these are just raw points rather than upweighted sales it likely shows a bias towards more recently released software as Famitsu's coverage increased over time. Cumulative Top 30 points 1986 - 1992. BKK, no Dreamcast shipment chart in the OP? What magazines are these scans from? I know the second one is from Edge, but what about the other two? I should really begin to compile a datasheet with the data dig out in this thread. 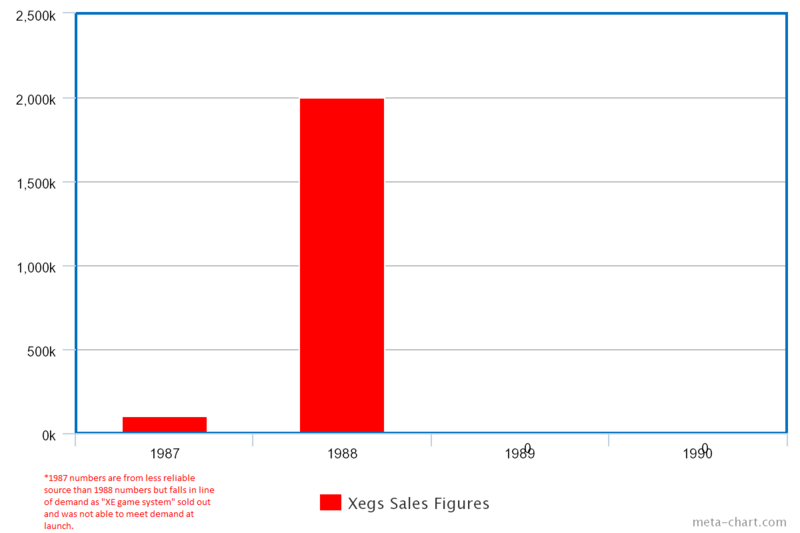 SNES and Mega Drive worldwide cumulative shipment sales between March '91 and March '96 (miss FY '94 for MD so I decided to left blank the SNES number too for that fiscal year). It's uncertain if the South America market is accounted for. 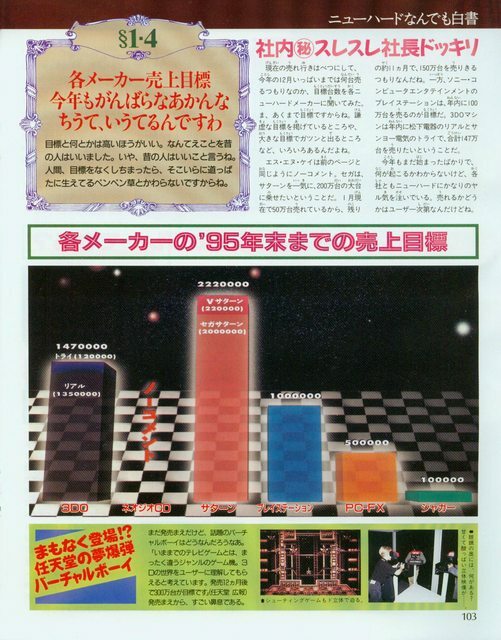 Those are however the shipment data given by Sega and Nintendo to Famitsu. 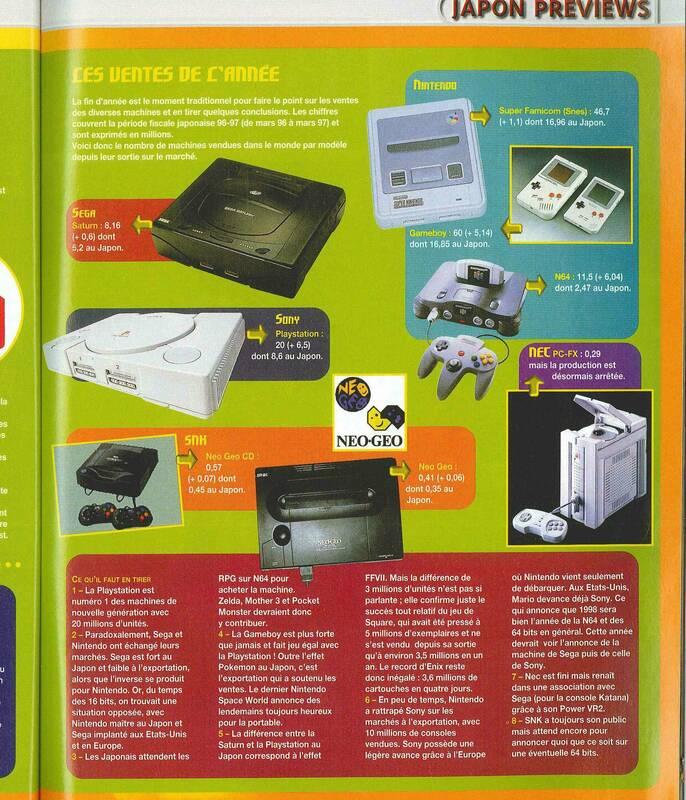 Third one is from Console Plus issue 73. First one I forgot, I think Edge/Next Generation. Sorry, a bit late back on this. Added now, unfortunately as they changed their reporting method we only have annual shipments until the last year, and don't have separate Asia/Japan shipments. I also added Virtual Boy and a link to Aquamarine's Nintendo Shipments thread. The first one is from Mega issue 23 (August 1994). Though it introduced the TurboDuo, TTi had never had to manufacture more TurboGrafx-16 units; in fact, says Brandstetter, the last 100,000 to 200,000 U.S. consoles were unloaded on the Brazilian market, with their expansion ports disabled. The initial order NEC made in 1989 for 750,000 units never sold through to U.S. customers. As for the Duo? "Turbo Zone Direct had Duos for at least 10 years," Brandstetter says. 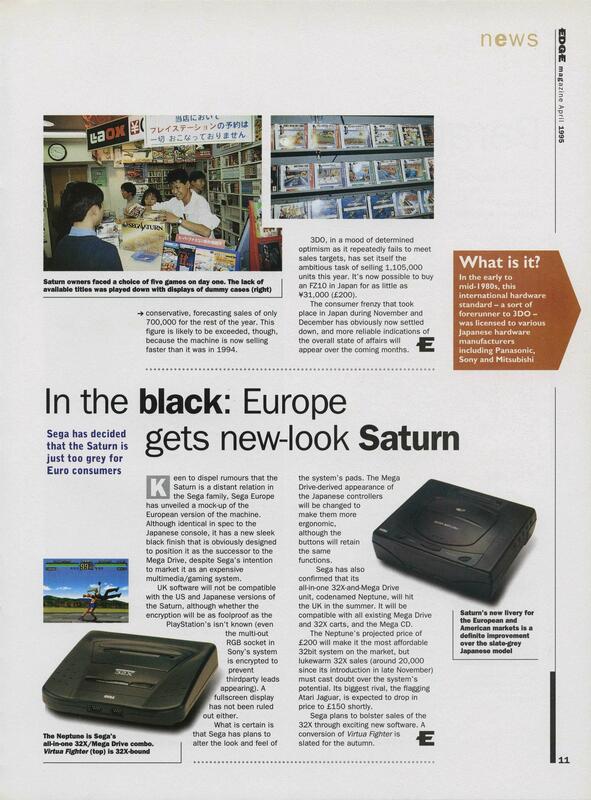 Thanks for this, always wanted to see 3DO shipments + Saturn yearly sales. 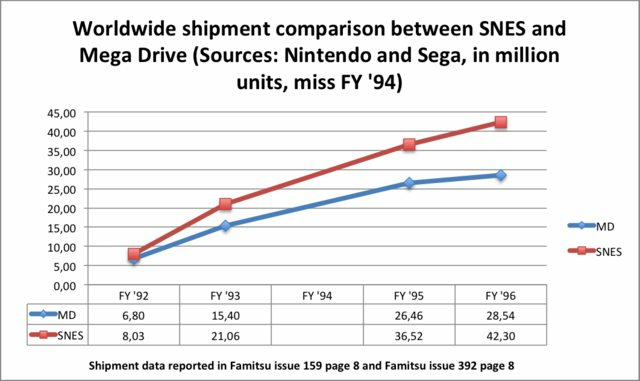 I recently found information for FY95 PS1 shipments which shows it was at 0.8m and not at 0.85m as Famitsu estimate. 0.3m in Q3 and 0.5m in Q4. First number is from Sony, second number is from Lexis-Nexis PR. Well, the figures are in the OP. This thread is the best source* for old console sales. Actually the true sources are cited in it, with even scans if the source is inside a paper article. I was going to throw some 3DO charts for fun since a lot of sales for it are conflicting but then I realized that would be a mess and I also can't find all the places that had the numbers. The 3DO shipments don't make sense. 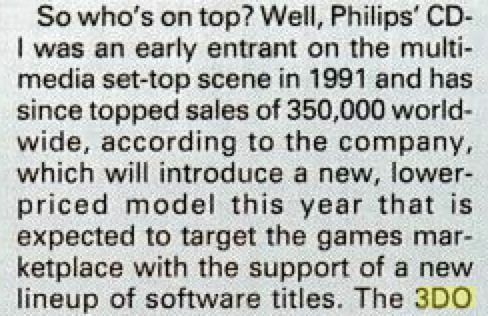 You have 1.32 million shipped in 1985, but 3DO announced an install base of 500,000 mid way through the year, so that would mean that there were 820k 3DO units on shelves which doesn't make much sense. 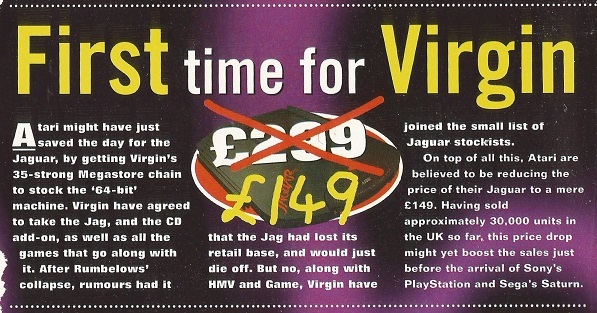 It wasn't selling anywhere well enough to have that many extra units shipped. You are right 0,77M is for FY '95 and 1.32M for FY '96.